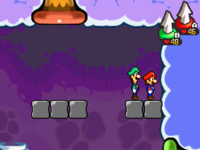 The Flab Zone is an area in Bowser's body, where Mario and Luigi go to find the princess in Mario & Luigi: Bowser's Inside Story. 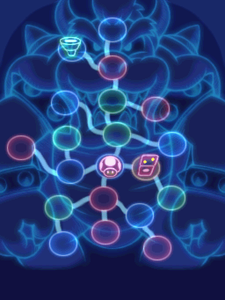 This area can only be explored when Bowser is fat due to being tricked into eating excessive amounts of high-fat content food made by Fawful after beating Midbus (it is heavily implied that Fawful did this specifically in order to draw out Princess Peach in order to capture her and awaken the Dark Star). Here, they encounter many new enemies. Through a few rooms, they find Princess Peach being held by several Kretins. Mario and Luigi watch in horror as they carry her away. Luigi runs after, but stops on a Donut Lift and falls into mucus. A white figure named Princess Lipid drags Luigi up, and gives the Bros badges. They proceed through several rooms with Save Blocks and blocks containing Attack Pieces, including vortex-like objects only to be used by a Spin Jump. After learning how to do Spin Jumping, and to use the Jump Helmet, Mario and Luigi find the Kretins with Peach. Mario quickly brushes them off with his spin jump. Once the princess is conscious, however, the Kretins form together to make the Alpha Kretin. After defeating the Kretins, Mario, Luigi, Peach, and Starlow proceed into two more rooms; in the second one, Peach is abducted by Fawful. Though the Flab Zone cannot be accessed while Bowser is skinny, the player can go back to this area whenever they desire once Bowser learns the body slam. 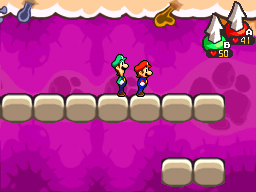 On their way, Mario and Luigi will often encounter two pipes where only one is the right path; the other connects backwards and if the two mistakenly enter it, they will lose their progress. Nutsoglobins are found in this area and provide information on which pipe the bros. should take. The entrance to the secret room, found in the room where Mario and Luigi learn the Spin Jump move. The following are overworld items found in the Flab Zone in Mario & Luigi: Bowser's Inside Story. Super Mushroom In a ? Block in the second scene. In a ? Block in the upper scene after the first fork. x2 In a ? Block in the first scene after the maze. 1-Up Mushroom In a ? Block in the middle scene after the third fork. Super Nut In ? Blocks in the middle scene after the second fork. Syrup Jar In a ? Block in the lowermost scene after the second fork. Supersyrup Jar In a ? Block in the lower scene after the first fork. In a ? Block in the uppermost scene after the third fork. In a ? Block in the first scene after the maze. Retry Clock In a ? Block in the first scene. Attack Piece #1 In the attack piece block in the second scene. #2–5 In a ? Block in the upper scene after the first fork. #6–9 In a ? Block in the lowermost scene after the third fork. #10 In an attack piece block in the scene with vomit. POW Boots In ? Blocks in the middle scene after the second fork. Good Badge Given by Princess Lipid. Mushroom Badge Given by Princess Lipid. The name of this area may be loosely based on Flat Zone, the Game & Watch stage of Super Smash Bros. Melee and Brawl. This page was last edited on December 30, 2018, at 05:45.